A truck driver pulls onto the inbound scale at the Farmers Cooperative Elevator Co. in Hemingford, NE. The message board at right will display the gross weight and direct the driver to the appropriate receiving pit. Photos by Bruce Selyem. The summer wheat harvest season used to be a time of chaos around Farmers Coop Elevator Co. in Hemingford, NE (308-487-3325). With more than 3 million bushels of storage, the cooperative’s headquarters elevator at Hemingford is one of the largest grain facilities in the Nebraska Panhandle and draws winter and spring wheat from many miles around, as well as corn, millet, oats, and barley. 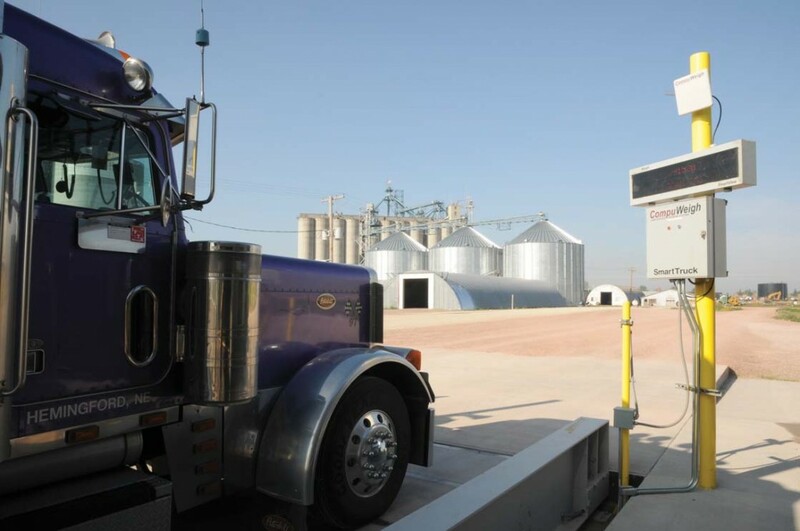 The facility also had three different sets of inbound and outbound truck scales, installed over the years as the elevator expanded both in terms of capacity and volume, says Grain Division Manager Bart Moseman, who came to Hemingford in 2006 from a northeast Nebraska cooperative. Those three sets of scales caused a logistical nightmare at the height of wheat harvest, far and away the largest crop brought to the elevator. Semi trucks would be moving in every which way, causing monumental traffic tie-ups and long waits. Each set of scales required personnel to operate. Grain samples were coming in from every direction into a single grading laboratory. Truckers were having to get out of their cabs to get directions to the appropriate receiving pit. The potential for routing, grading, and settlement errors was huge. In the spring of 2009, Farmers Coop Elevator implemented a solution by consolidating three sets of truck scales into a single pair of inbound and outbound Sooner Scales. The side-by-side 90-foot pitless scales were installed adjacent to the elevator’s receiving shed. 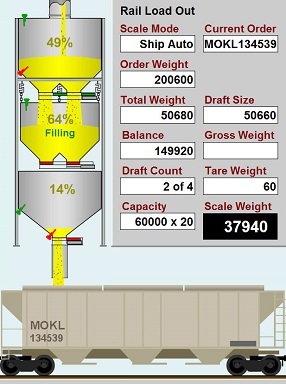 And the entire system of receiving grain now is automated using the SmartTruck automation system from CompuWeigh Corp., Woodbury, CT (203-262-9400). system to call the control room. 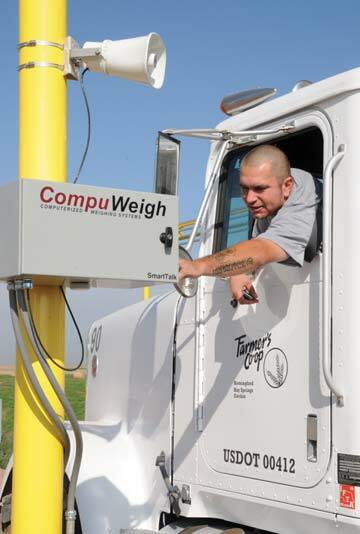 The two new truck scales and probe now are under the control of CompuWeigh’s SmartTruck automation system. Incoming grain trucks first stop at a probe station 400 feet ahead of the scales, where their RFID tags are read by SmartTruck, and the most recent trips by that truck are shown on the inspector’s computer screen. Located next to the driver is a SmartTalk highfidelity intercom, with noise suppression, so the driver can talk clearly to the inspector. A new Gamet truck probe collects a representative sample, with the assistance of a video camera. The sample is sent via pneumatic tube to the receiving shed, where it is graded and the results entered into CompuWeigh’s grading workstation. The trucker proceeds to the inbound scale, where a second SmartTruck system reads the RFID tag, ensures that the truck is correctly located on the scale, and then takes the gross weight without any human intervention. The SmartView outside message board displays the gross weight and tells the driver which dump pit to go to. After dumping the grain, the driver proceeds to the outbound scale. This scale also is unattended, and once the truck has come to a stop, SmartTruck reads the RF card, checks that all wheels are on the scale, calculates the net weight, which is displayed on the SmartView outside message board, and then prints the ticket on the OTP outside ticket printer, which is right next to the driver’s cab. Without leaving the cab, the driver takes the ticket, and then can leave the facility. Although both scales are unattended, each has a SmartTalk intercom next to the driver’s cab, so that the driver can communicate with the control room staff, if necessary. At no point during the weighing process does the driver get out of the cab.